#MayonVolcano Help Make A Change ~ Mommy Meowmeow! Hello friends! A bit of a public service post here, as requested by my cousin, Erika. We all know the #MayonVolcano situation and every bit of help can make a change, even your PHP 70.00 can already feed many. But of course, if you have more to share then please do for our fellow Bicolanos weathering this challenge. 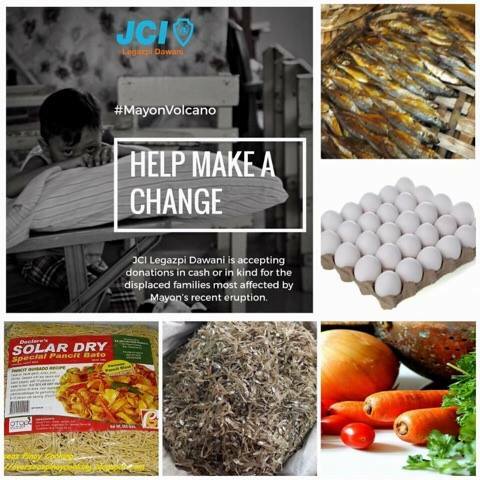 The Junior Chamber International (JCI) Legazpi Dawani is undertaking Project Oplan Kaagapay, a reach-out mission to provide assistance to the displaced villagers within the eight kilometers danger zone of Mayon Volcano. JCI Legazpi Dawani is accepting donations in cash or in kind for the Oplan Kaagapay Wave 1 scheduled on Sunday, January 28, in Camalig, Albay. Cash donations as low as PHP 70.00 will feed a family of 5; or in kind donations of eggs, pancit bato, dried fish (tuyo or tinapa) will help sustain their meals on that day. Please contact any of your Dawani Friends. Cash Donation can be endorsed to Dawani's East West account or any Palawan and Cebuana branches.